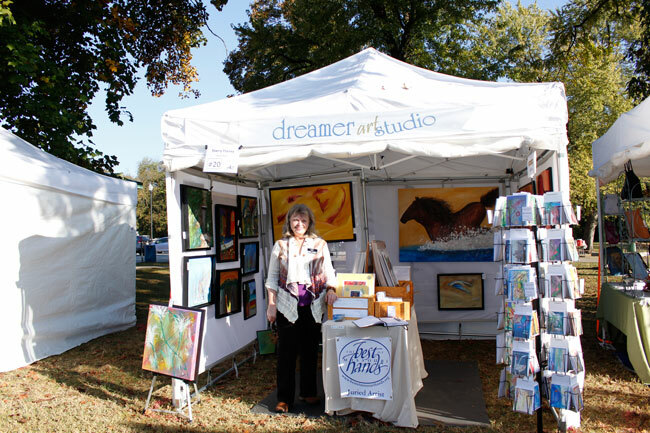 Just finished the art festival at Art in the Park here in Springfield, MO at Sequiota Park. The weather was a blessing and could not have been any nicer. The crowds were steady and happy. I have to admit that I was overwhelmed at how many came out – JUST TO SEE ME and my artwork. One customer bought another print to go with the one she bought last year, plus 2 original paintings. She said she was going to make a Dreamer Art wall in her house…WOW! Friends planned special outings, just to get their picture with me in my booth. Other friends drove from out of town, just to come say HI. I can’t even count how many friends showed up. I remember waving at some that couldn’t get in my booth because it was so crowded. Thank you again to all that came out…you make this middle aged artist feel on top of the world.